I first had the opportunity to see Sha Sha Higby work on the 2004 episode of KQED’s SPARK television program. Her work is not easy to describe. 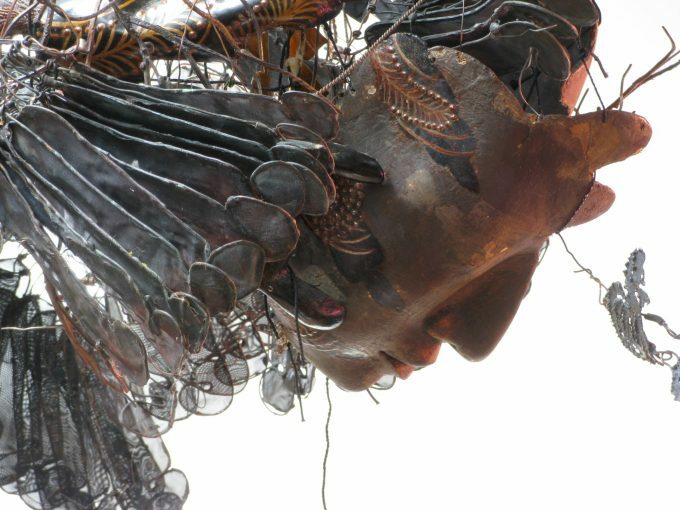 She’s both and artist and sculptor, and performance artist. She blends elaborate hand crafter costumes and masks into seconds skins she wears during her performances that echo ancient traditions and narratives. The moment you recognize something in her work she introduces something otherworldly to it. It can be easy to be dismissive of artists whose works are hard to understand. The fact that each costume, and the performances that go around them, take years to build, shows you the dedication she has for her work. I was initially drawn to the episode and her work because of her mask making, and it would be easy to dismiss the rest of her work. Till you realize that her masks are the go-between the audience and a performer. International performance/sculptural artist, Sha Sha Higby is known for her evocative and haunting performances using the exquisite and ephemeral body sculpture she meticulously creates herself and moves. 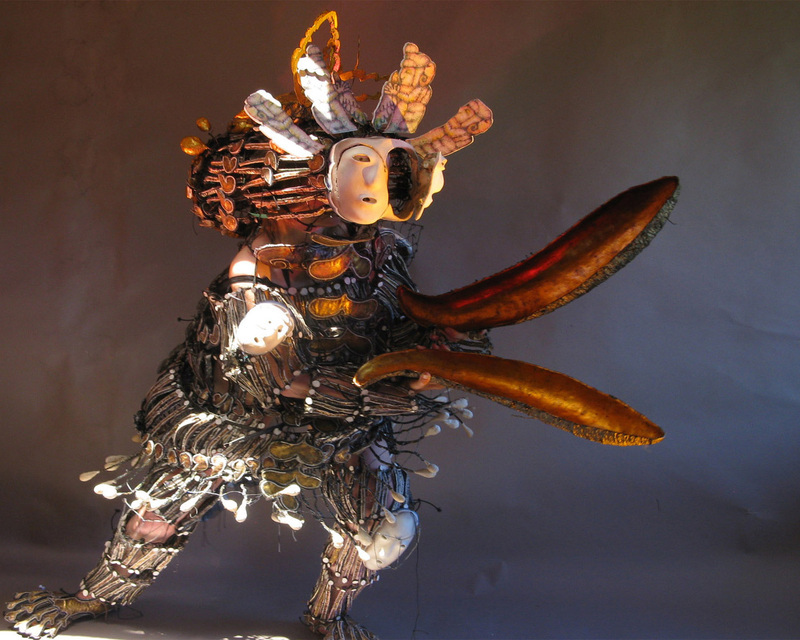 Elaborate sculptural costume, dance, and puppetry explore magic and emotion; creating an atmospheric world within the borders between death and life’s Higby started out making dolls and pursued the art of puppetry and sculpture in her early years. Ms. Higby has performed her unique body of work throughout the United States, and internationally in Korea, Japan, Indonesia, Slovakia, Bulgaria, Singapore, Australia, Switzerland, England, Belgium, Germany and Holland. She is the recipient of numerous grants and awards including the National Endowment for the Arts Solo Theater Artist Fellowship, The Zellerbach Family Fund, and the California Arts Council New Genre Individual Artist Fellowship. She studied for one year in Japan in 1971, observing the art of Noh Mask and theater and then received a Fulbright-Hayes Scholarship to study dance & shadow puppet making and performance arts in Indonesia for 5 years at the Academy of Music, Central Java, Indonesia. In addition to traveling throughout Southeast Asia to Thailand and Myanmar (Burma), she received an Indo-American Fellowship to study the textile arts of India, and a Travel Grants Fund from Arts International to study in Bhutan. She has also recently studied lacquer arts in Tokyo and Kyoto, Japan through the auspices of the Japan-United States Friendship Commission.